We can’t thank all our donors enough for providing us with the vital financial resources that allowed us to implement our various programs in 2018. More than three dozen Angel Investors, six Golden Angel Investors and our first-ever Arch Angel Investor, along with more than 100 other contributors, have been incredibly supportive in our first full year. Your financial support makes a real and meaningful impact in the lives of those individuals who have had their lives shattered due to a spinal cord injury. We look forward to your continued support in the years ahead as our work has just begun and we need to aggressively grow our programs and capabilities in order to have a larger impact on our underserved community. A Spinal Cord Injury leaves visible and physical scars on the individual, but what many people don’t see or begin to understand is the financial toll it also takes. Aside from the dramatic short length of stay for rehab (most get an average of four weeks of rehab following this life-altering injury), there are therapies and medical supplies and equipment not covered by health insurance plans. Need to make modifications to your residence to make it habitable and accessible? You’re completely on your own. And if you’re thinking of getting extended rehab? Good luck with that. We recognized and have experienced these challenges for ourselves and it was with that experience that we launched the Road To Recovery program in April of 2018. This program provides grants of up to $2,000 to be used toward therapy, purchase of specialized medical equipment or minor home modification for individuals without the financial means or health insurance coverage for such out-of-pocket expenses. Since its launch, we approved 14 deserving individuals with these grants. Our investment of $28,000 allowed them to achieve their goals as they continued on their path to recovery and independence. Watch this brief video of one of our grant recipients, Matthew Machuca, who was injured in a horrendous car accident in 2017 when he was a couple of months shy of his 18th birthday. His story of recovery inspires us to support him and as many others as possible. “There are always things that can be done after a Spinal Cord Injury and unfortunately, the most effective therapies are not yet recognized or covered by insurance. I found it so exciting but also incredibly hard frustrating as it is so difficult to raise enough money to continue my specialized physical therapy. In collaboration with key partners, we played an active role in presenting the first-ever “Day on the Lake” event at Vasona Lake and Park in Los Gatos where some 100 individuals with physical disabilities were able to enjoy water-based activities. Watch this fun video highlighting the event that will bring a smile to your face. Continued with our outreach into hospitals and rehab facilities by conducting in-service presentations raising awareness within the medical community on ways NorCal SCI serves individuals with SCI. These facilities included Santa Clara Valley Medical Center, Alta Bates, California Pacific Medical Center, John Muir Medical Center, San Joaquin Valley Rehabilitation Hospital, Fresno Community Hospital, Mercy Sacramento and Dominican Santa Cruz. We also welcomed Carol Adler Hughes, an incredibly talented and experienced Occupational Therapist to our Advisory Board. 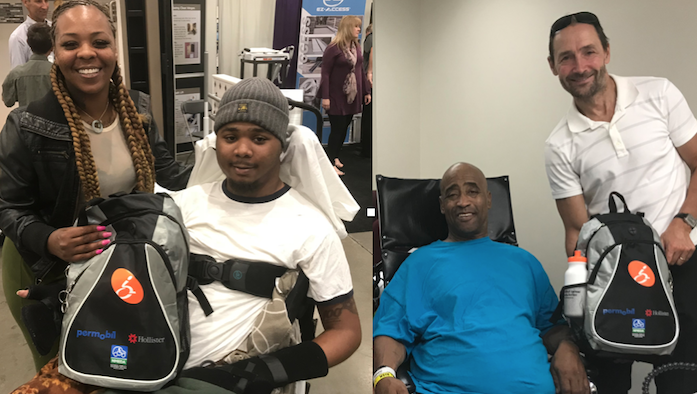 Providing critical and accurate information about spinal cord injury to the newly-injured is at the core of this program that saw 89 newly-injured individuals throughout Northern California receive their very own Care Package. They provide invaluable information that enable these individuals to better navigate the many challenges of their injury. Additionally, we include tools and equipment including smart technology such as the Amazon Echo and Google Home Mini that allow for greater independence and efficient methods of accomplishing goals. Outside of Metropolitan areas, access to specialized medical professionals with expertise in SCI is difficult, if not impossible. Our solution involved recruiting highly-skilled medical professionals and travel to San Luis Obispo as part of our first-ever offering of a Mobile Clinic that included a physical therapist, occupational therapist and nurse practitioner with specific expertise in SCI. They visited with 9 individuals with SCI for an hour each and provided appropriate recommendations to each individual on dealing with their particular medical challenges. Our follow up garnered outstanding feedback and appreciation from the community and our plans include not only to go back to San Luis Obispo in 2019 but also visit other locations in Northern California. Though this program was never part of our 2018 goals, it morphed organically into a popular one. There are very few organizations that accept donated durable medical equipment and then distribute them free to those in need. We now have a robust inventory of equipment such as power and manual wheelchairs, patient lifts, hospital bed, shower benches and much more. The current inventory is always available on our web site. We delivered 28 pieces of equipment to those in need in 2018 with an estimated value of $20,000. “NorCal SCI has been a source of support to me since I met them at the Abilities Expo a couple of years ago. Their newsletters are full of pertinent information. They are eager in finding solutions for the needs of our community! Every Tuesday morning at 9 a.m., some 820 registrants of our weekly newsletter open their inboxes to learn about the events, news and information relevant to the spinal cord injury community. It is easily the best way of staying on top of spinal cord injury news for the Northern California area. In 2018, we updated the look and feel of the newsletter as well as the platform on which it is produced, giving it a more polished and professional look. We invest a lot of time and resources to ensure that our web site is the most complete, accurate and relevant site with information for the SCI community in Northern California. Our monthly unique visitors have nearly doubled since the beginning of 2018, ending the year with about 16,000 unique visitors. We launched a brand new directory of rehab centers in Northern California that we feel will drive additional traffic as those with new injuries in the future would be searching for an unbiased source of such centers to learn about. Our footprint on Facebook, Twitter, Instagram and YouTube continues to grow significantly as we now have dedicated volunteers responsible for these social media channels. We assisted over 20 individuals who called our Help Line seeking solutions to various problems related to their disability. 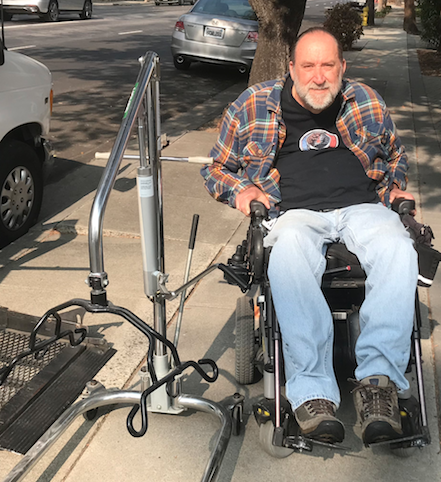 The nature of the calls ranged from knowing who to call and where to go for subsidized housing to how to secure specific types of assistive devices to help with driving from a wheelchair. 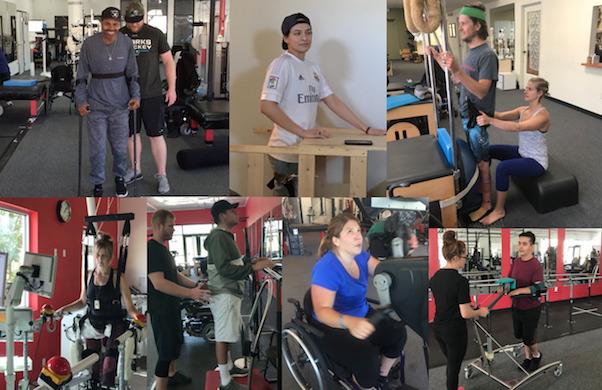 In July, we organized and held a full-day Peer Mentoring training day involving 27 individuals with spinal cord injuries, medical professionals and family members. 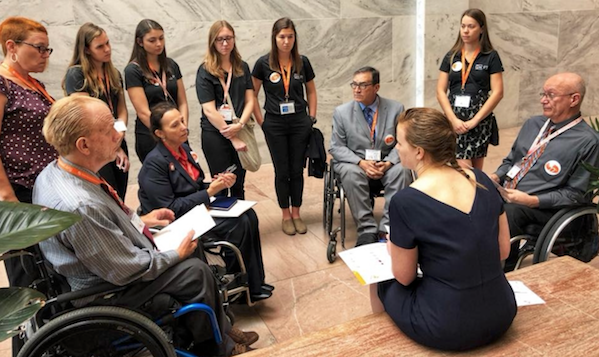 Participants came from as far south as Fresno to as far north as Sacramento and the day was led by a professional trainer from the United Spinal Association. By partnering with the Apple Store in Los Gatos, we coordinated four accessibility technology training sessions at the Apple Genius Bars in Los Gatos, Burlingame and Palo Alto. Responding to a complaint from a person with SCI regarding the lack of an accessible passenger drop-off at San Jose International Airport, and their seemingly unwillingness to do anything about it, we worked with the airport over a two-month period and successfully lobbied them to dedicate a zone specifically for disabled passenger drop-off at Terminal A. The work was completed in mid-December. This is was one of our biggest achievements of the year which, at that time, truly left us at a loss for words. 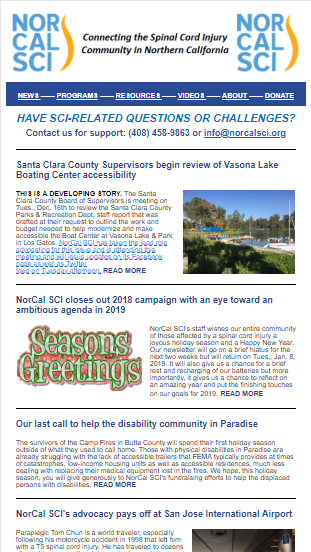 We ended the year on a super high note by working with and lobbying the County of Santa Clara Board of Supervisors to fund a project that would make Vasona Lake and Park’s boating center in Los Gatos accessible to those with physical disabilities. The lake would be the first of its kind in Santa Clara County to become accessible with the County committing nearly $600,000 for the project. 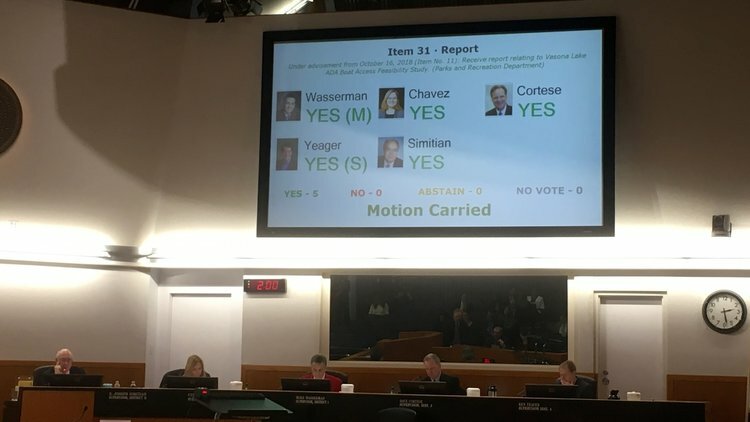 Santa Clara County Board of Supervisors voted unanimously to invest nearly $600,000 to make Vasona Lake fully accessible for boating activities. At our first-ever fundraising party, Robyn and Krystina Jackson got the evening started with a two-song set. As you can read from the reporting of our financials, we were blessed to have been supported by an incredible group of donors who stepped in during 2018 and contributed generously with their donations. To expand the pool of financial support and to also celebrate with our supporters, we hosted INSPIRE, our Inaugural Fundraising Party in October. The sold out by-invitation event was held at Bramble & Bier in Los Gatos and helped us net over $36,000 in one night. Thanks to a trio of incredible friends working at Google, we were nominated and invited by Google to take part in their annual “Giving Week” festivities. We were provided with a table to exhibit exclusively at one of their larger famous cafeterias to engage with employees and encourage their financial support of NorCal SCI. Altogether, in a span of three hours, we received over $12,000 in donations from employees’ contributions. We applied for several “industry” grants in 2018 and though our expectations were that we will not receive them due to our short time as a non-profit, we will continue to apply for them in 2019 in addition to many others to help supplement our sources of funding. When we launched NorCal SCI in May of 2017, we made a commitment to transparency all throughout everything we’re doing. A key component of that includes financial transparency and so, we were thrilled that GuideStar, the world’s largest source of information on non-profits, awarded us with the Silver Seal of Transparency. A significant commitment we made is to operate the foundation just like a business and thus, we determined that the best way to start doing that is by filing taxes with the Internal Revenue Service just like any business would. We completed that for 2017 and will continue to do so for the ensuing years. This allows the public to freely review our operating income and other financial details and how we’re investing such income.